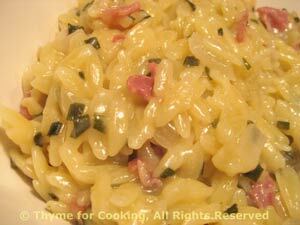 Orzo, risotto style, with Prosciutto, Thyme for Cooking easy side dish. The orzo is cooked in a minimum of liquid, so the starch, that is normally lost during cooking, turns into a creamy sauce, aided by some freshly grated Parmesan. One thin slice of Prosciutto adds a distinctive finish. Melt butter over medium heat in a small saucepan. Add the onion and sauté until tender, about 5 minutes. Add wine, stock, Prosciutto, and bring to a simmer on medium heat. Turn heat to low and simmer until done, stirring occasionally, about 15 minutes. All stock will be absorbed. Stir in cheese and chives.